Have you ever been in a situation where you feel like your grip is slipping and you just cannot hang on another minute? I am not a rock or mountain climber, but I have watched documentaries where climbers would lose their grip or footing, and suddenly they were dangling in midair, swinging over deep crevices from safety harnesses. My stomach lurches at the mere thought -- if they had not been firmly anchored and held by safety ropes, these climbers would have fallen to their certain deaths. Some years ago, I was being quiet and meditative when a moving picture started to play in my mind's eye. I saw the Lord Jesus scaling up the side of a huge craggy mountain and I was with him. (It seemed he was bent on us getting to the top.) I wasn't climbing; Jesus was carrying me up the mountain with him. Except, I was not nicely tucked under his arm or straddled to his back. No, no, He had me by the arm, and I dangled as he climbed, much the way a toddler would schlepp his teddy bear around by one arm. Seeing myself in that precarious position, and remembering visions from those documentaries, the thoughts raced through my mind. What if I can't hold on? What if my sweaty hand slides out? What if I get so tired that I just let go? 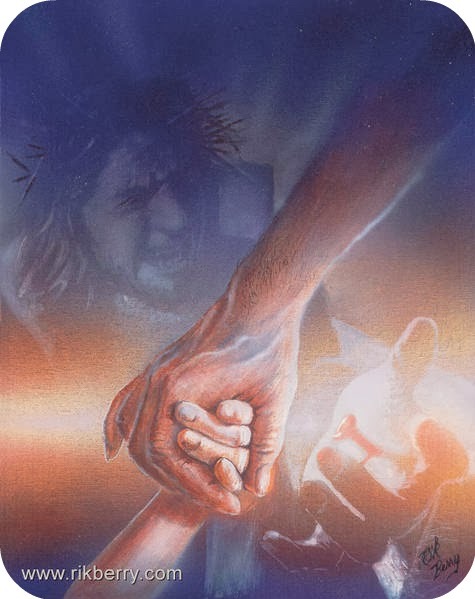 It was then that I heard Him say, "You are not holding unto Me, I am holding onto you." In that split second, it was as if the 'camera' zoomed in and I saw He had a firm hold of my wrist. My being safe in His grip had nothing to do with my own ability or strength -- He was holding me. The scene still looked pretty wild and scary but I didn't feel the fear anymore. Sometimes we get to places in our lives where it seems we can't hold on another second. The pressure is too much, and the stress is enough to make the tops of our heads blow off. We're losing grip -- and as one friend facing her own precipice in a life situation once said -- we're barely holding on by a fingernail. But in truth, though we fall, we are not utterly cast down, for the One who hurled universes into existence grasps our hand in support and holds us tight. That changes everything. We can relax at least a little, maybe even enjoy the ride or the scenery. 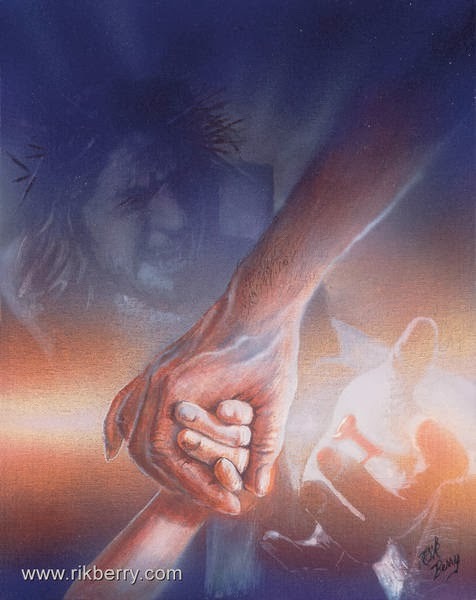 We might still be dangling, but He's got a good grip and He's not letting us slip out of his fingers. Not now. Not ever. This is so true, Brenda, and how we need reminding so often. Thank you for this. Your paper tidying is rewarding work! These are reassuring words. I will show them to a friend of mine, who will probably appreciate them right now. Now that is as helpful as any analogy I have ever read or heard. I understand what you are saying and even had times when I did "let go". But there are those times when I just can't let go. It's nice to know and be reminded that I'm not alone with those feelings. It helps to read that you too, have those times. Next time I won't let go, I will try to remember, Brenda letting go. The picture is a great visual for me.